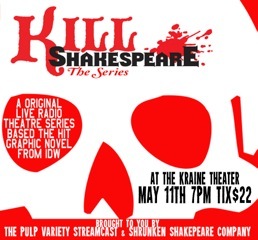 Shrunken Shakespeare Company and Pulp Variety Streamcast members are poised to star in new authorized adaptation of IDW's graphic novel Kill Shakespeare. And it's got a pretty healthy group of participants in the action. Cast members include will include Yvonne Cone (Shakespeare & Co, SSC, TBG), Jennifer Martina (SSC, PVS), Sam Parrott (Shakespeare & Co, SSC), Michael Moreno (Shakespeare Forum: Merchant of Venice; Shakespeare & Co.: All's Well...), Sketkh Williams (PVS), Robert Davenport (SSC, UCB), Eric Chase (One Life to Live, SSC, PVS), Amanda Baumler (SSC, PVS), Matt Golden (PVS), Equiano Mosieri (Shakespeare & Co: Romeo and Juliet; Berkshire Theatre Fest), Richard Templeton (PVS) and Adam Luke (PVS). This new adaptation of Kill Shakespeare is based on the IDW comic book series created by Anthony Del Col & Conor McCreery. It is the first ever authorized adaption not written by Del Col and McCreery, bringing the comic to life as a live radio-theatre show and podcast. Kill Shakespeare pits The Bard's greatest heroes: Hamlet, Juliet, Othello, and Falstaff, against his menacing villains: Richard III, Lady Macbeth, and Iago. In this hilarious and epic adventure, the characters go on the search to find the mysterious and reclusive wizard, William Shakespeare, who controls their destinies. SSC and PVS will host the live radio play at The Kraine Theater on Sunday, May 11th, at 7 PM. Drinks will be available during the performance and well as a raffle after the show to win original Kill Shakespeare prizes and memorabilia. Raffle sponsors include: Forbidden Planet, Brooklyn Brewery, Midtown Comics and many more. Tickets for Kill Shakespeare are $22 each and can be purchased through SSC’s website at www.shrunkenshakespeare.com. Shrunken Shakespeare Company and Pulp Variety Streamcast members star in new authorized adaptation of IDW's Graphic Novel Kill Shakespeare. Cast members include: Yvonne Cone (Shakespeare & Co, SSC, TBG), Jennifer Martina (SSC, PVS), Sam Parrott (Shakespeare & Co, SSC), Michael Moreno (Shakespeare Forum: Merchant of Venice; Shakespeare & Co.: All's Well...), Sketkh Williams (PVS), Robert Davenport (SSC, UCB), Eric Chase (One Life to Live, SSC, PVS), Amanda Baumler (SSC, PVS), Matt Golden (PVS), Equiano Mosieri (Shakespeare & Co: Romeo and Juliet; Berkshire Theatre Fest), Richard Templeton (PVS),Adam Luke (PVS). SSC and PVS will host the live radio play at The Kraine Theater on Sunday, May 11th, at 7pm. Drinks will be available during the performance and well as a raffle after the show to win original Kill Shakespeare prizes and memorabilia. Raffle sponsors include: Forbidden Planet, Brooklyn Brewery, Midtown Comics and many more. Tickets for Kill Shakespeare are $22 each and can be purchased through SSC’s website atwww.shrunkenshakespeare.com. PVS will be teaming up with SSC’s artistic team and company members for the Kill Shakespeare collaboration. The production team includes SSC co-producing artistic directors Yvonne Cone and Jennifer Martina, PVS producer Sketkh Williams, SSC production manager Christian Lemay, and SSC company manager Amanda Baumler.